Pet Peeves! - Today's Subject : Deli "Encounter"
Pet Peeves will be an on going post for me. It may at times have nothing to do with Ozzie or bulldogs etc! Just simply things that I find annoying times 10! The other day I had the opportunity to go to our local Shop-Rite which is a grocery store found mostly in the northern New Jersey area. They were in the midst of their famous January can-can sale which always guarantees a madhouse! It was early and I was hoping to get some cold cuts for lunch. I approached the deli counter to find that they were serving number 21. "Hmm" I thought, "not bad, doesn't seem crowded!" As I pulled a number from the red ticket dispenser I ended up with number 41. Yikes, 20 more people to wait on! Where were they all! Probably cruising the store until their number came up!? Since I could not think of an alternate meal for lunch time I decided to stick it out there. So I set up camp armed with my cell phone and weekly circular. It was early Sunday morning so I called the only person I dared would be up and about, my brother. Of course he did not answer. I left him a message " Help I am stranded at the deli counter for at least 30 minutes. " Call me back if you can and talk me out of hitting myself over the head with a hunk of cheese!" I went on to peruse the circular for some good buys. I am not sure how much time had passed when I heard "Number 42! "I ran up to the counter hip checking some old man on the way! I have it as I waved my ticket in front of the deli clerk's face! "No you don't!" she said "you have number 41, we already called that number!" "I'm sorry I have been waiting so long I must of fell asleep!" I quipped! The deli clerk gave me a stony faced glance. Obviously she did not find the amusement in that. "Well can't you take me anyway, I was standing right here the whole time?!" "Okay' she replied dryly, "what do you want?!" I asked for a pound of turkey and shortly received a half pound. "I said one pound of turkey" didn't I? "Ok, Ok I will just give you another half pound" exclaimed the clerk in a dismissive tone. Not only do I get the privilege of standing here all day I get emotionally abused as well! She came back over to me and and asked me what else would I have. I said ONE pound of the Shop-Rite Swiss. Then she replied with a question in a Polish accent that not even a pirogi could understand. ( sorry to all my Polish friends! ) Huh...can you say that again. Once more it tumbled out of her mouth and all I understood was "cheese"! "One more time" I pleaded! She was totally frustrated with me at this point and I had wished I had just bought a package of hot dogs for lunch! As I deciphered "Shop-Rite" Swiss I just shook my head! She returned from the slicer and threw the package of Swiss onto the counter. "Anything else?" she said. Even at that moment if I did want something else it had mercifully vanished out of my head! No, no that's it! I think she sighed a bit as I walked away. I still had shopping to finish and now it was almost lunch time! I headed to the hot dog aisle. I best stock up for the next time I have to bail out at the deli counter! 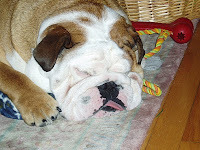 English Bulldogs have the capacity to sleep the sleep of the dead! They are in such a deep delightful slumber it makes one wonder what they must be dreaming! ( most probably a giant bowl of kibble! ) There have been times that I have come home and the little guy still snores away unaffected by my arrival! I have found this video of Teddy who's owners do everything to try and wake him up until they are "saved" by the bell! Take a peak but be quiet! 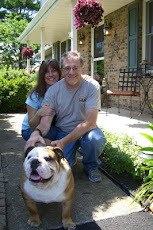 Teddy the English Bulldog jumps for the doorbell&#8230;.and that&#8217;s it. Wanted: One Mess of a Dog! Wanted- Creature that drools endlessly on floor clothes etc. Must have experience with omitting gas on cue that can clear a room. Skilled at shedding year around a plus! Snoring at high decibels required! Deep face wrinkles that require constant cleaning and can smell like dirty water in the bottom of a garbage can desirable! 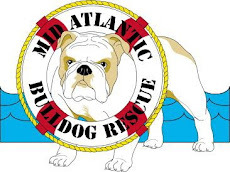 It is like folks that now own Bulldogs run this ad in searching for a dog!? That is exactly what ones gets with the Bulldog. He comes by all these traits honestly! You may ask yourself why would anyone want a dog with a resume like this. I can answer for myself at least. When you look into that smushed in face and those big brown eyes they just own your soul! They are there to keep you company and amuse you daily! At your side is the place they need to be! As I write this Ozzie is sleeping at my feet and tooting up a storm so I need to make this short! 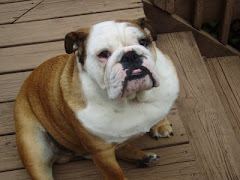 I found a poem on another bulldog blog that I would like to share with you! It expresses the whole dog thing very succinctly! I have got to leave the room now! Have a good day all! Bulldog Eruption and Frozen to the Bone! This past weekend was a bit stressful to say the least. The only good thing at the end of the day was that Ozzie lost 2.5 pounds....the hard way! I had made an appointment last Monday at the vet to get his left leg checked out. He had been limping for a couple of weeks mostly when he got up from a laying down position ( yes his favorite position!) . Our vet , prescribed an anti-inflammatory called Rimadyl. 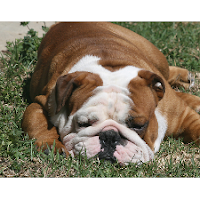 She felt that there was nothing torn or broke and that it was more due to the orthopedically challenged construction of a Bulldog. Along with a chondroition glucosamine supplement he would improve. I started giving Oz his medication and noticed that the next day he had terrible gas! The kind that would clear out any room in 2 seconds flat. I know that these dogs can be prolific farters but this was extremely odorous! Thursday night found Ozzie tooting away and I stayed up late with him to make sure there wasn't a need for a midnight potty run. Friday afternoon we were to leave for Vermont to go skiing and I had scheduled Ozzie to board Friday night at the vet's. I woke up to discover various piles of poo and vomit all over the house! My goodness what carnage went on during the night?! Poor Ozzie!! Poor me! As I began the clean up in full hazmat gear I surmised it was the medication that was the culprit! I called the animal hospital as soon as they opened to let them know I was bringing him in! This little guy was pretty sick. I was really scared that he would dehydrate and something awful would occur! As I sat in the waiting room he just laid there on the floor next to the door refusing to move. Once he was in the examining room the vet tech wanted to take his temperature. I told her " Are you sure you need to stick that thermometer there?! " Needless to say Ozzie did not let that happen. His poor little rear end had taken enough of an assault already! The vet came in and sat on the floor next to Ozzie and examined him. She assessed that he more than likely was having an allergic reaction to the anti-inflammatory. He needed to be put on IV fluids and anti-biotics. By this time all the vet techs had swarmed into the room with us. They were all awwwing over Ozzie. The office manager, Tara who has a bullie of her own promised to give the Oz special attention while he was there! It was like an Oz Fest in the room. Ozzie groupies every where. I felt a little better in leaving him in such attentive care. We drove up to Vermont Friday night. I called in to check on him. I spoke with Tara who said he was comfortable. I heard him barking in the background so I knew he was feeling stronger! By Saturday morning he was recovered and the vet said that he could go home. My son Will picked him up. Will remarked that he was stubborn about getting into the car with him. I don't know if Ozzie is aware the way William drives or he didn't want to leave his fans?! Meanwhile up in Vermont the high for the day was 10 degrees Fahrenheit! This means I froze my tuckus off. Well mostly my hands and feet. He has to be pretty darn cold to freeze that tuckus of mine! I was anxious to get home Sunday to see Ozzie! We got in around 8:00PM ish to see the Oz waiting patiently...his little corkscrew tail a wagging! He looked fine, no worse for the experience he was through. As he walked over to my husband he still had that limp! Yeah we were back where we started, except in our wallet. Mark now refers to it as his 1000.00 dollar limp! Oh well there is no place like home! Right Ozzie?! Arf, Arf! 2010, Year of the Bulldog! Happy New Year to all. Here is hoping 2010 brings an abundance of all things good for you! I don't make resolutions, they are usually a set up for failure. Though I try to keep a good attitude for the year ahead and look at it as an opportunity to try new things or simply improve on last year! The holidays were hectic. My dad was visiting with us and there was a lot of shopping, cooking and eating etc.! Ozzie enjoyed all the extra attention! He reveled in wrapping paper and chomped on boxes ( this boy loves cardboard )! On Christmas day he must of had an extra 2 pounds of ham from his Uncle Freddie who unwittingly played into his sad sack begging routine! We are now back to normal and it's kind of quiet around here! Not to mention that the weather has been a little chilly to say the least! We are suppose to have another Artic blast of cold this weekend which will send wind chills diving into single digits! Ozzie doesn't seem to mind the cold too much! He goes outside to do his business in the back yard, eats some dirty snow and runs back in! I am sure he yearns for those warm June days when he could just lay on the deck and soak in some of the suns rays. Oh well he will have to dream on the couch until then. Snuggled up in my Snuggie mind you that I got for Christmas! Move over you big lug!